A Dixie cup spoon for my marrow, please! 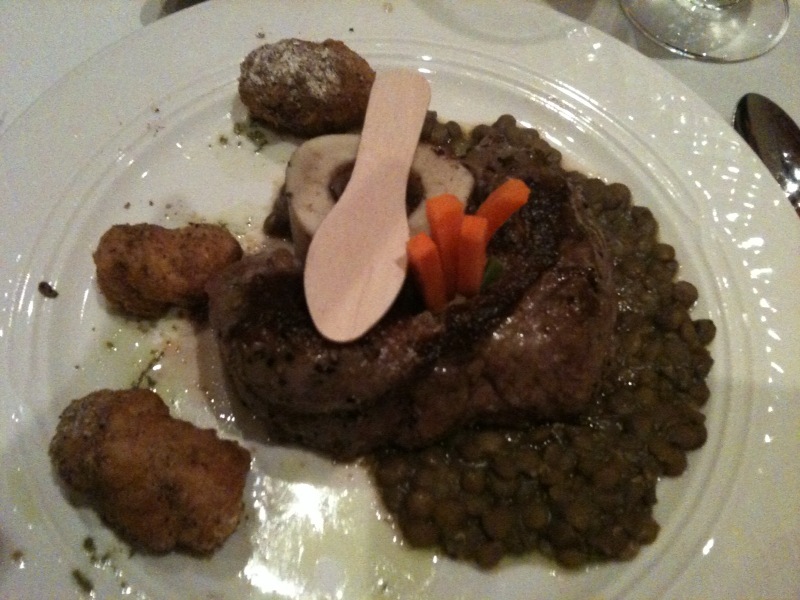 Had to share this photo – gotta love the wooden paddle spoon – for the Snake River Farms Wagyu Black Strip around a Marrow-Morel Mousse Bone over Lentil Puddle with Morel dusted Beignets. 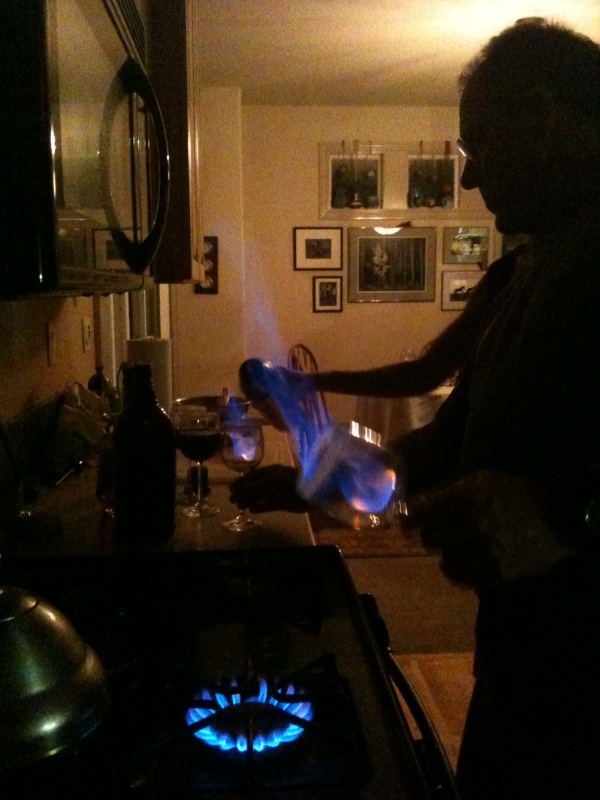 When blue flame is involved…. …how can a drink NOT be good! Got treated to a fantastic meal by our dear friends the Armstrongs. I’m always in awe of truly talented chefs who can make magic in their home kitchens. And the fact that flame was used twice just made the whole night rock. This time – Spanish Coffee freakin’ fantasticness with flame courtesy 151. A few years back I was teaching at a culinary school. I was an adjunct instructor for the kitchen lab. They used to hire chefs for a four-week block to teach students new trends and menu items from their restaurant. I was trying to give back to the old school that I attended; I wanted to show the instructors what I had learned since I had been gone. I did not graduate with a culinary degree. Instead, I received a BA in Philosophy ??? that is why I still cook. So I was hoping to return and show just how far I had come to the instructors whose classes I had either dropped out of or failed. I loved teaching culinary students. It was great to see the diverse group of people learning the great craft of cooking. But I did not feel like I had left my mark. I had no great wisdom to pass on, or so I thought. Fast forward almost six years and I am at the Flying M downtown waiting for my double-shot mocha and I run into a disheveled looking young man in a chef’s jacket. We begin to chat and we realize that I was his instructor for a short while. I vainly asked him if he remembered anything that I taught him. ???Well?????? he said. ?? ?I remember one thing. You taught us how to cook our families.??? By the look on my face, he knew I was confused. He went on to explain that in a lecture to my kitchen lab, I was trying to explain how to cook different cuts of meat. Fatty chunks, sinewy cuts, young tender cuts, etc. I guess I told them to think about their families and how they would cook them. Old and grizzled grandpa? Braise him. A lot of connective tissue needs to be broken down to be edible. Plump Aunt with good marbling? Roast her. She will self baste. Young tender brother? Quick saute. I was trying to tell them all how to analyze a cut of meat and then cook that meat with the proper technique. My lasting moment for a former student was not exactly what I had in mind. No earth-shattering revolutions, no mind-blowing transcendental experiences, no introduction to Platonic forms, not even a quick overview of the categorical imperative from this chef. ???Great. I taught you how to be a cannibal,??? I said. Add this to the best headline of the week list. Or the best foodie headline of the year. And now, I am thinking of how to cook different cuts of meat per my family tree. Thanks Randy! I wholeheartedly agree with the sentiment that you can’t trust a skinny cook. 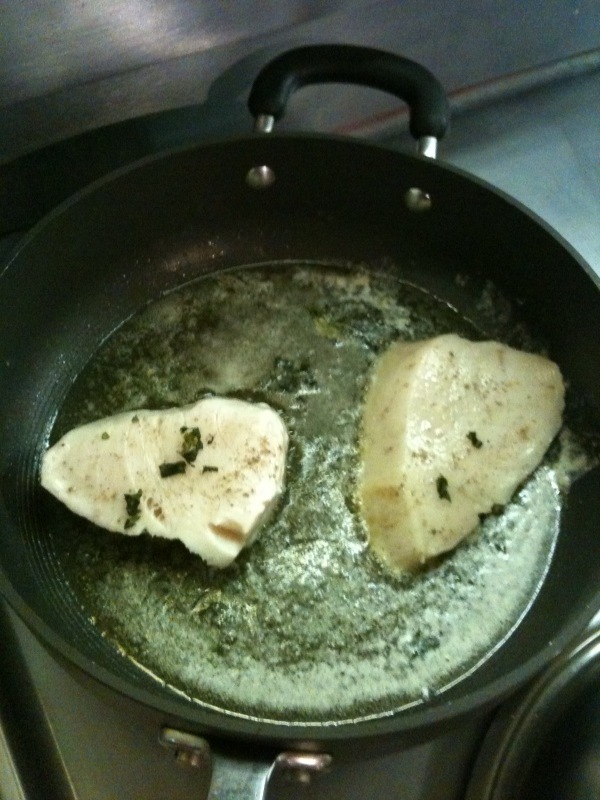 Which perhaps justifies my decision on how to prepare a fish known as ‘butterfish’… why, butter poach it of course! I was thinking steak but when the hostess told me they had Walu my mouth started watering and I walked out with two filets. Next to a kickass piece of fresh halibut I had while dining overlooking Victoria Harbor (butter poached of course! ), the last time I had such fond memory of a fish was Walu we’d had on a trip to Kauai. Now, little did I know that Walu (aka ‘Butterfish’ aka ‘Oilfish’ aka Hawaiian Escolar) gets somewhat of a bad rap among certain bloggers and foodies. This type of fish contains a unique oil that – for a small percentage of the population – causes some, ahem, intestinal issues. So if you do the Google and stumble upon those listings don’t be swayed. Per online advice from various chefs – keep your portions to less than 7oz to be on the safe side, and preparations that work for halibut are also great for Walu. After going down the rabbit hole after recipes specific to Walu and becoming very frustrated, we (as in Kevin doing the cooking and me jumping around the kitchen) decided to go to the old standby of simple seasoning (fresh basil, pepper & freshly ground smoked salt courtesy the Co-op’s fancy salt shelf) and butter poaching. Melt chunks of butter, float the fish in the bath of goodness over low heat, and voila! And we kept the whole meal simple. Someday we’ll master the art of the multi-colored meal. For now – the Fiesta ware has to provide the color. 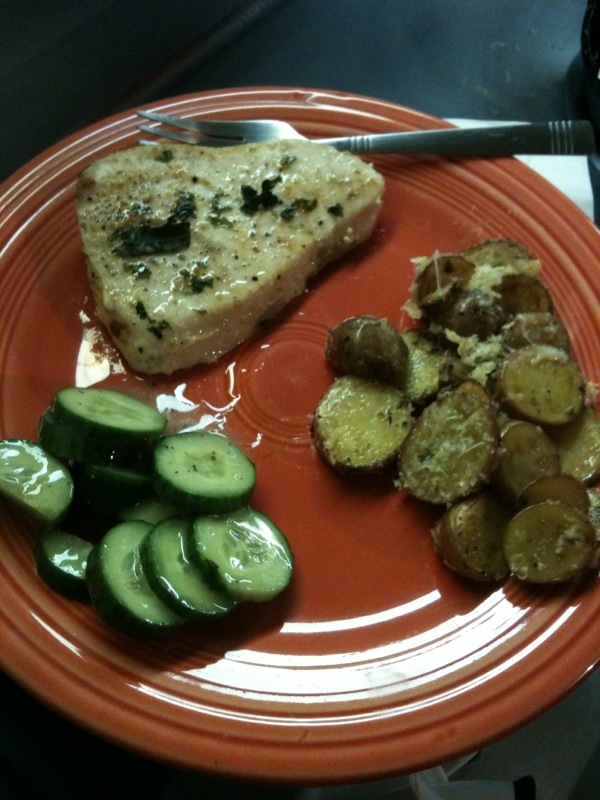 Idaho’s Bounty cucumbers in simple vinaigrette and quick sauteed red fingerling potatoes with parmesan. The Walu rocked – and definitely invoked the foodie memory of Kauai. And I’ll be going back to the Fresh Market at CG – though a tip or piece of advice from the kitchen on prep would be a nice added touch! Else I may try to butter poach some Rib Eye.